My vegetable garden is made up of 8 squares that are 8’ x 8’. Landscape timbers, three high, frame three sides of each square. A timber wall runs along the back. There is a two-foot path in between each square and a moveable walking board placed in most of them so I don’t have to compact the soil once it is tilled. The last square is used for compost. All kitchen scraps are taken to the garden, but some are eaten by animals who love pineapple, oranges, and various other choice bits. The square next to the compost is catnip and rhubarb, plus a volunteered asparagus. It must have crossed over from the adjacent square that is totally asparagus. You can see the ferns in the far back of the picture. The other squares vary, except for the perennial herbs: regular oregano, Mexican oregano, thyme, French tarragon, and rosemary. Every year so far I’ve tried something new. At least every other year I add rich composted soil to each square. It goes in the middle towards the back, and is covered with newspaper or black plastic. This is the part that’s hard to reach, so the compost feeds the surrounding plants. 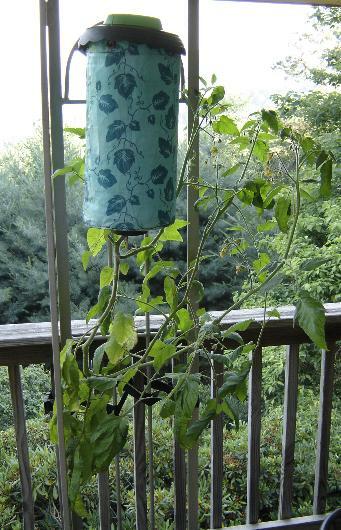 I put my cucumber teepee around this area, plant tomatoes around it, and most other planting too. 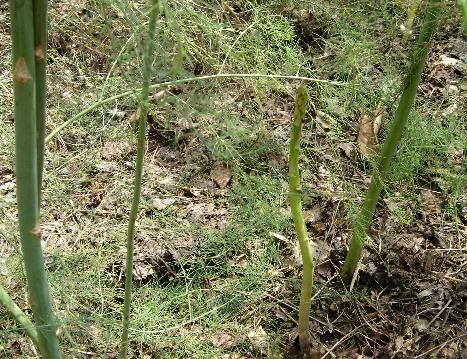 The asparagus square gets a layer of mulched leaves in the fall. In the early spring I pull the leaves back to add two bags of composted manure. That is the easiest thing to grow in my garden. 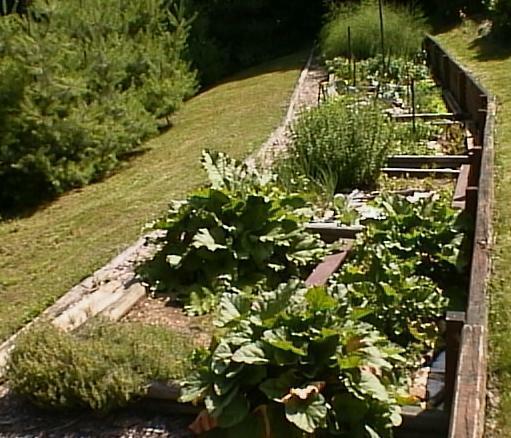 My attempt to grow an organic garden is a constant trial-and-error education. Many plants do well with no problem. Squash was a problem with borers. Then I read that dill around the plants would deter insects. Sure enough, it works. 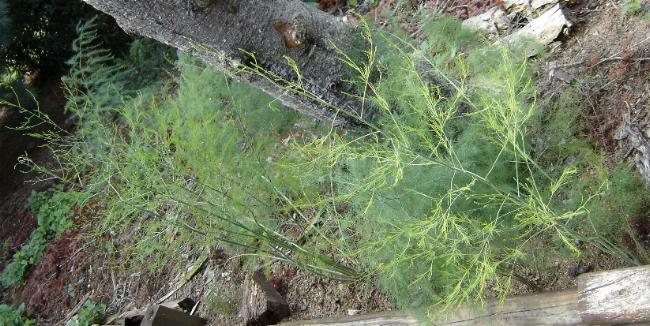 Dill is a tasty weed in my garden, even more endearing because placing the pulled plants around the squash plants keeps it healthy, and bug free. There are more and more organic pest deterrents, so most problems are solved. But the raccoons have kept me from growing any more corn. The first few ears are delicious! Then the raccoons take the rest. 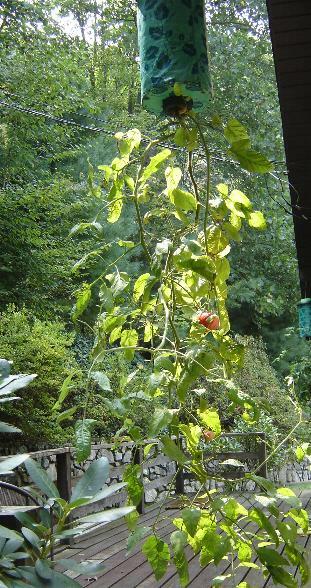 Tomatoes always produced enough to keep my neighbors and me happy for a while, but then always get the blight. Then I read about the Topsy Turvy planters. They hang on my back porch, which also keeps the groundhogs from getting their bites. They seem to be blight-free. I did have to add a screened barrier because a wren raised three babies in the top of one last year. I use lots of newspaper and black plastic to keep down the weeds. These are covered with mulched leaves so they look a little more attractive. Once the plants start growing, it looks much better anyway. Sometimes you never know where the next garden space will be. Birds must have added this asparagus patch behind my woodpile. And I thank them for it!